Welcome to my Mustang stock eliminator project. I do hope you find some of this informative or entertaining. I grew up always drooling over the 1960's and 1970's NHRA stock and super stock race cars. Needless to say, I've been hooked on the prospect of class racing since I was very young. Finally, in 2003, I was able to spend some time and money working towards my goal. 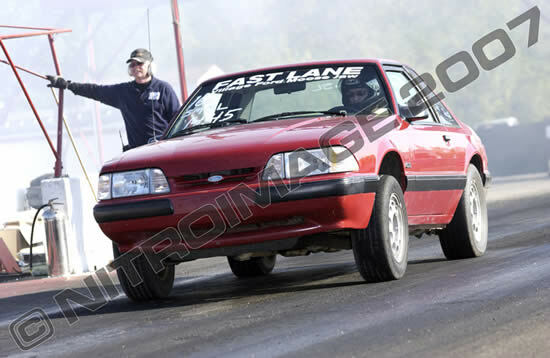 My goal: Build an NHRA stock eliminator legal mustang that can be driven to the track and run under the class index. I've got a long way to meeting my goal. However, I've got some great help available to me. UPDATE: I have since sold the car, however check out the additional 88 Mustang photos and information. I originally purchased the car in the summer of 2003 with 180,000km. The car was completely stock - including the original plug wires and silencer. As any AOD owner knows, the car barely could spin the tires. Especially due to the fact it had 2.73 gears. As with any high mileage car, I've done endless maintenance ranging from brakes, suspension, to heater core(s) (Argh), and countless leaks. 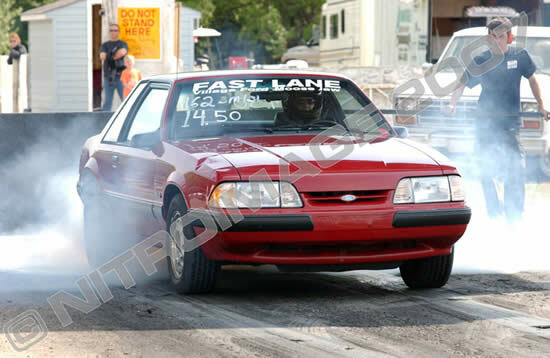 Sept 2003 15.89 @ 88.6mph First time ever down the track. Shifted in D.
Front tires 40psi / rears 32psi. I've been fortunate to have a very consistent car. In fact, on many race dates I've varied as little as 5 /100ths all day long. These are my thoughts on how to be successful at drag racing and making a consistent starter bracket car. Pay attention: Racers are an extremely competitive bunch of people. They'll spend thousands of dollars and hours just to gain a small advantage. Don't forget that. Put your time and energy where you can make a difference: My mantra has been make the car consistent and learn to cut good lights. I'm sure I could wring another 3-4 tenths out of my car at the cost of some consistency. The car can take years to get dialed in. However, for $99 you can buy a practice tree. Be alone at the tree: Ignore you opponent until your near the last 200ft. It is you vs. the tree. Do the maintenance: If you hear a squeak or rattle or something seems amiss - it probably is! Spend the time and money needed to rectify the problem before it begins. It is no fun losing first round but it's even worse to lose in the final because your your starter just died. Know your car: Make changes one at a time until you find out what works for your car. Don't jack the fuel pressure, timing, adjust the tires, etc.. all at once. You need a planned approach for understanding what works best for your car. Make changes that make your car more consistent not necessarily faster. In my case, I often tell people I'm running about 90% - and I'm not referring to nitro - by taking out some timing and rpm my car responds by being more predictable.